If you want to see large, luxurious yachts — the largest in-the-water collection of them in the entire Western U.S. — there’s only one place to go: The 34th annual Lido Yacht Expo, Sept. 27-30 at Lido Marina Village. Whether you’re in the market for a new boat — or for new ideas and accessories for updating your present boat — you’ll find much to see at the Lido Yacht Expo. Here, attendees get a rare “up-close-and-personal” viewing opportunity and an invitation to step aboard and compare the finest in luxury yachts — including cruiseworthy motoryachts, offshore sportfishers, sleek sailboats, long-range trawlers and head-turning sport yachts. With a well-earned reputation as the West’s ultimate fall “big boat” show, the Lido Yacht Expo is produced exclusively for the big boat market, featuring only boats 26 feet and larger. Some of the models to be showcased here will be seen for the very first time at a boat show in Southern California or on the West Coast. Southern California’s top boat dealers and yacht brokers will present nearly 200 models at this year’s Lido Yacht Expo. Along with the larger yachts, show-goers will find a big selection of 35- to 65-footers on display, plus, the latest must-have marine accessories, boating gear, advanced electronics, engines, generators and essential yacht services — including marine financing and insurance. Industry experts say now is the best time in recent memory to buy a boat, thanks to the extraordinary deals and incentives now available. Boat buyers will find low financing rates and, for the first time in years, a wide variety of available marina slips to choose from throughout Southern California. With sleek lines and ample space aboard for lavish entertaining, the 2013 Cranchi 58 Flybridge, presented at the Lido Yacht Expo by Newport Boats, is ready to take its owners cruising just about anywhere in total comfort. This large and luxurious motoryacht offers three cabins with two heads and showers, a hydraulic swim platform, sliding side windows in the salon, underwater panoramic lights and full teak aft, flybridge and side decks. It is powered by twin Volvo IPS 900 powerplants with convenient joystick controls — and this Cranchi 58 Flybridge comes loaded with cruise-enhancing features, including a Sea Keeper stabilizer system, Hamilton auto trim tab controls and a dynamic positioning system. If you’re in the market for a proven sportfishing yacht with an excellent reputation, look no further than the Viking 56 Convertible, presented by Stan Miller Yachts. Viking Yachts has been a dominant factor in the 50- to 60-foot class of sportfishers for the last 15 years, and the 56 Convertible is one of the many reasons why this yacht builder has been so successful. The 56 Convertible is nearly a foot wider than its predecessor, the popular 55C (1998-2003), and it shares the sleek sheer line of its newer stable mates. This 2004 edition comes nicely outfitted with optional MAN 1550 Common Rail power and the preferred optional interior layout. Orange Coast Yachts will present an 80-foot Ocean Alexander with an expansive layout for comfortable cruising. This 2007 edition comes loaded with everything needed to cruise the West Coast of the Americas or transit the Panama Canal, and then cruise to the East Coast. Comfortable accommodations, spectacular equipment and an Ed Monk-designed hull that offers a great ride in all sea conditions are key features of this special motoryacht. Chuck Hovey Yachts — the West’s exclusive dealer for Fleming Yachts — will present the 55 Fleming Pilothouse Motoryacht at Lido. 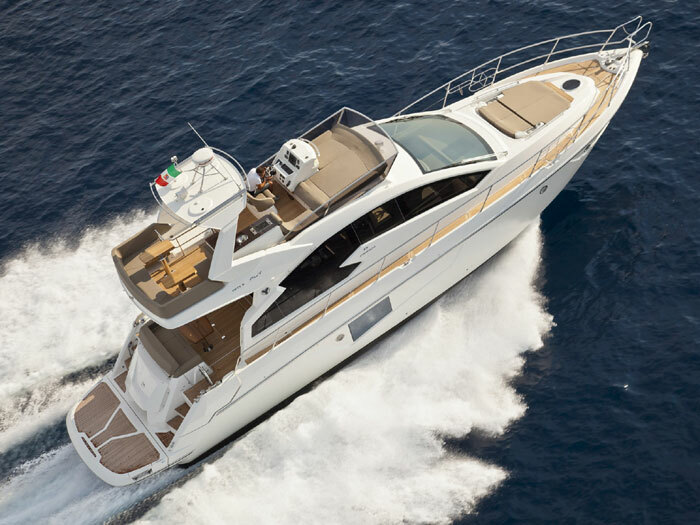 Fleming Pilothouse Motoryachts — including the 55, 58, 65 and 78 — are proven, serious long-range cruising yachts. Smooth, quiet and dependable performance are hallmarks — and more than 200 Fleming Pilothouse Motoryachts have been sold to date, all over the world. Continuous refinements and upgrades are built into every Fleming hull. Hand-laid construction resulting in solid heavy-displacement hulls, and “no-nonsense” building techniques and materials have resulted in exceptional resale value for Fleming motoryachts. The 64 Ocean Alexander’s 20-foot beam makes this 1999 edition, shown by Orange Coast Yachts, a remarkably large and roomy long-range cruiser. It is designed by Ed Monk to cruise comfortably in all sea conditions. Tank-tested and meticulously engineered, it offers substantial speed and safety. The 64 is capable of coastal navigation from Alaska to the East Coast. Ocean Alexander custom built — and overbuilt — this first boat of its new Classico series. The very best and latest in equipment was installed aboard, and seemingly no option or upgrade was left off. Orange Coast Yachts will also present ocean-tested 60 and 61 Ocean Alexander models at the Lido Yacht Expo. According to Cabo Yachts, the origin of its Cabo 48 Flybridge can be traced directly to feedback from owners, who said they wanted a wave-busting sportfisher with three staterooms — but only if it had the Cabo stamp on it. Cabo Yachts created the 48 to be a top-performer on the fishing grounds, as well as a remarkable liveaboard cruising machine. With a modified-V bottom, dependable CAT diesel power, outstanding electronics, a custom forward stateroom, extra portholes for natural light and ventilation, a large inverter and a watermaker, this 2004 edition from Stan Miller Yachts is exceptionally well-equipped and ready to head offshore. With sportyacht styling and a wealth of cruiseworthy features, the 2013 Regal 42 Sport Coupe — presented by Newport Boats — offers an ideal platform for onboard entertaining or family relaxation. Unlike some coupes that simply have a window, a small skylight or a hatch, the Regal 42 Sport Coupe offers the largest sliding sunroof in its class: a convertible top that spans the entire beam of the cockpit and, at the push of a button, slides to reveal a 38-square-foot opening. Other standout features of the 42 Sport Coupe include Volvo IPS 500 powerplants with joystick controls, cockpit climate controls, a smokeless grill in the cockpit, underwater lighting, a teak deck and aft stainless steel enclosure sliding doors. The brand-new Grand Banks 39 Eastbay SX, shown by Stan Miller Yachts, will be making its first appearance at the Lido Yacht Expo. The 39 SX marks the evolution of an icon: It is the successor to the pace-setting 38 Eastbay that Grand Banks launched more than a decade ago. With its graceful, sweeping lines, the restyled and reconfigured 39SX brings new “curve appeal” to the Eastbay Series. It also packs a set of new performance features beneath that refined exterior, matching classic beauty with pure exhilaration at every turn. Atop a proven deep-V hull designed by C.R. Hunt Associates, the 39 SX can easily top 30 knots while keeping dry and steady through any sea conditions. For serious sportfishing enthusiasts, Stan Miller Yachts will show a new Cabo 32 Express — a modern take on the traditionalist’s sportfisher: compact, agile and absolutely seaworthy. Just like the rest of the Cabo Yachts fleet, it is designed to meet the specialized needs of the serious saltwater angler, featuring gear and amenities normally found on much larger models. Don’t let the size of this pocket battlewagon fool you: The 32 Express is pure Cabo Yachts inside and out, and is pound-for-pound one of the finest sportfishers in its class. With Italian-inspired styling, combined with sportboat handling and performance, the 2013 Regal 27 FasDeck — presented by Newport Boats — is no ordinary deckboat. The 27 FasDeck has sharper, more defined lines than other boats in its class — and with the performance and ride of Regal’s proven FasTrac hull, the 27 FasDeck is capable of speeds in excess of 45 mph. Features include Volvo 8.1 GI DP power, a Regal View touch-screen monitor with cruise control, a Power Tower, Arena seating, a refreshment center, underwater lighting, docking lights and an anchor windlass. Lido Marina Village is located at Via Lido and Newport Boulevard in Newport Beach, one block south of Pacific Coast Highway. Show hours — rain or shine — are noon to 7 p.m. Thursday; 10 a.m. to 7 p.m. Friday; 10 a.m. to 7 p.m. Saturday; and 10 a.m. to 5 p.m. Sunday. Admission is $15 for adults and free for children 12 and younger — and major credit cards are accepted. There’s free parking and a continuous shuttle, and guest docks are available for show attendees’ vessels up to 21 feet. The Lido Yacht Expo is produced by the Duncan McIntosh Co. Inc., publisher of Sea Magazine, Boating World, The Log Newspaper, FishRap and Editor & Publisher, and producer of the annual Newport Boat Show, set for April 18-21, 2013. For an updated list of exhibitors, directions, parking and shuttle information, and additional details on the 34th annual Lido Yacht Expo, visit lidoyachtexpo.com.